On 26 May 2019, the best tennis players in the world will take to the clay courts of Stade Roland-Garros in Paris to compete in the French Open. Thanks to its distinct surface, Roland Garros has historically favored players with a less aggressive game, as the dulling effects of the clay can limit competitors with a more aggressive game. In recent years, this has seen Rafael Nadal dominate the men’s tournament, while the women’s event has produced 8 different victors in the past decade. 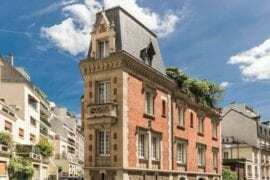 In short, it’s one of the most exciting tournaments on the Grand Slam circuit, and if you’re looking to complement your trip to the French Open with beautiful Parisian accommodation, we’ve found some of the best homes the 16th Arrondissement has to offer. 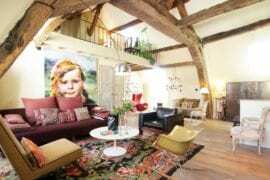 Parisian design is historic, beautiful and, to some extent, relatively uniform. Barring big name structures like the Centre Pompidou, it’s somewhat rare to find contemporary details in the streets of the French capital—especially when it comes to living spaces. But they are out there. 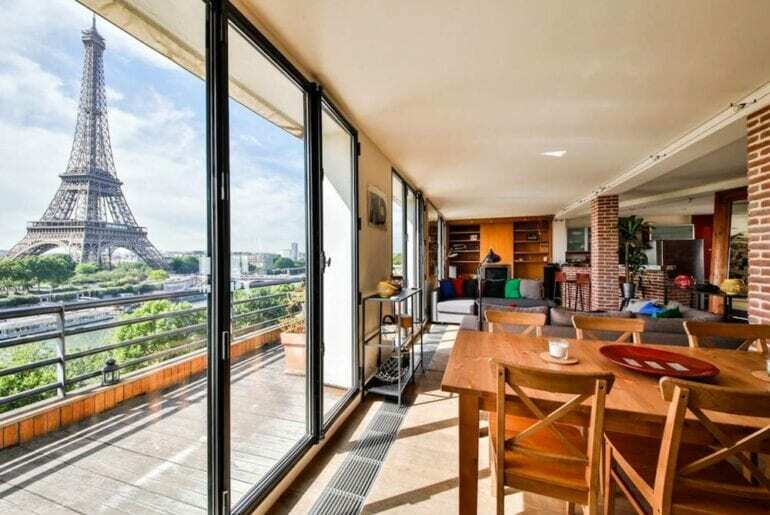 And in the case of this 3 bedroom apartment right across the Seine from the Eiffel Tower, they can be as magical as their more traditional counterparts. The apartment features a large, open-plan living space with a wraparound couch, dining area and a kitchen and bar. There are hits of exposed brick throughout and a vibrant, turquoise tile finish on the master bathroom which, thanks to an efficient use of space (Paris is very tightly packed, after all), flows nicely into the bedroom. 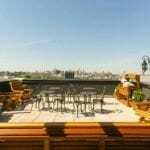 Most importantly, an expansive deck offers views of the city’s most famous landmark. 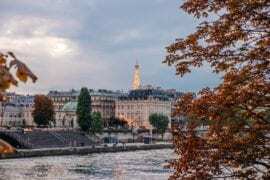 Roland Garros itself is a short drive away, or a leisurely hour long stroll along the Seine. The detailed flourishes of traditional Parisian design are carved into the whitewashed walls of this renovated apartment. 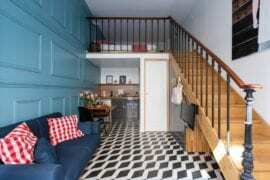 The three bedroom home, located steps from the Eiffel tower, may have a muted finish on the walls, but it is complemented by deft design accents. Colorful artwork and bright furniture stand out against hardwood floors, while small touches in the bedrooms and bathrooms—like distinct headboards and pattern tiles—bring further contemporary characteristics. The open, airy space is the perfect place to relax following the tennis, which can be reached via the close, beautiful Bois de Boulogne park. The clay of Roland Garros isn’t the only unusual surface in this picturesque corner of Paris. 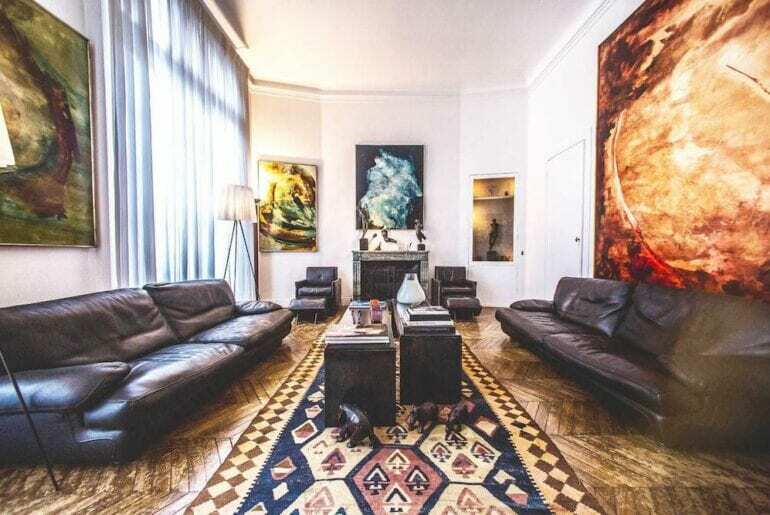 The varnished, parquet flooring of this four bedroom apartment is also a site to behold. The intricate geometric pattern is a good indication of the attention to detail seen throughout the home, where gold finishes, unique artwork and unusual light fixtures share space with expertly appointed bedrooms and an ultra modern kitchen. Each room has its own unique design, epitomised by the Détente Room, a peaceful living space with a very loud pink aesthetic. 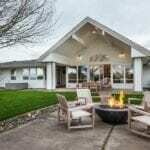 Don’t let the luxe decorations fool you—this is still very much a home: family photos line the corridors and the bedrooms and bathrooms don’t sacrifice function in favor of form. 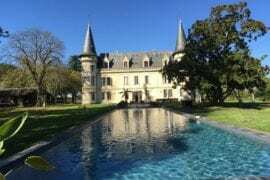 It is close to the Arc de Triomphe, Eiffel tower and the numerous other landmarks throughout this in-demand area, meaning you can get a real sense of the city, even if you mainly came for the clay court action. 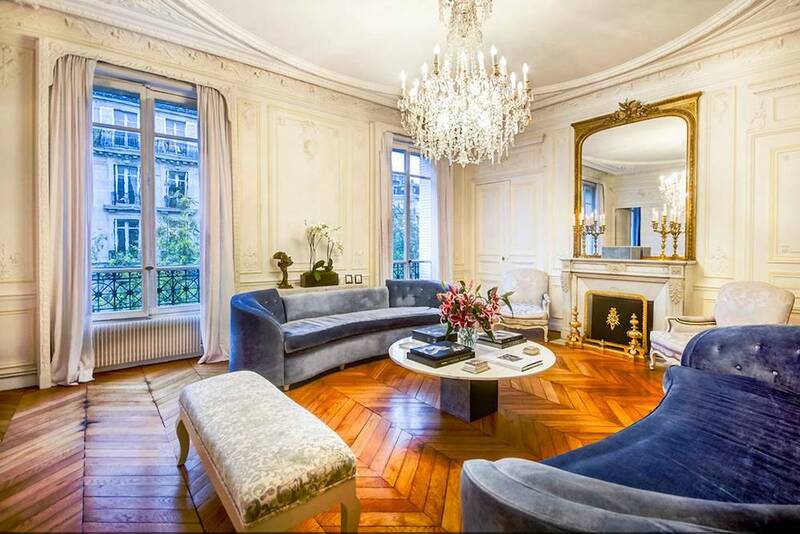 Built in 1890, this three bedroom apartment takes up the full floor of its building in true traditional Parisian style. Its century-old heritage can be seen throughout the interior, where ornamental designs on the ceilings, walls and doorways evoke the city’s architectural history. The bedrooms feature grand bed frames and furniture, reflective of your opulent surroundings; while large communal spaces, complete with traditional touches, will provide a welcome sense of upscale Parisian lifestyles. Roland Garros is about a 10 minute drive away. And if you don’t feel like driving, you’re in luck: the host provides a full-time driver (at the wheel of a Mercedes S-Class, no less) during your stay. 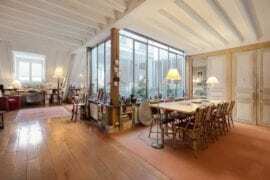 Huge, floor to ceiling bay windows allow light to flood the rooms of this three level apartment, illuminating the collection of modern art located within the home. For those looking for something different, the contemporary interior design, the bedrooms—each decorated in a unique style—and the grand entrance to the building is sure to impress. 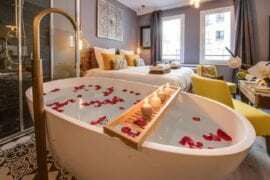 Its location, walking distance to the Arc de Triomphe and Champs-Elysées, will also please those hoping to explore the sights. Nearby, the tree lined thoroughfare of Av Foch will lead you to Bois de Boulogne, the park with Stade Roland Garros at its southernmost end. 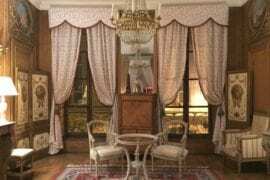 The French have a real track record when it comes to elevating luxury to super-luxury. Just look at the Palace of Versailles, or the rest areas on the freeways. 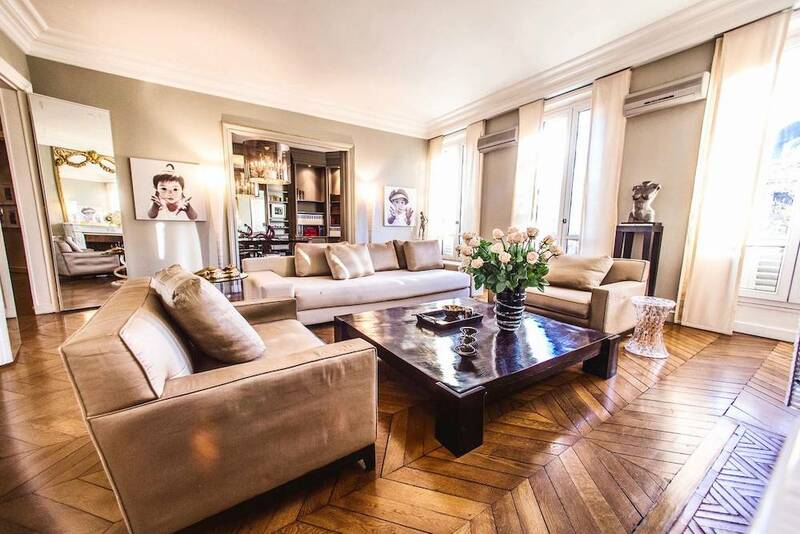 This reputation is further cemented by this magnificent apartment, located at the intersection of avenue Georges V and avenue des Champs-Elysées. 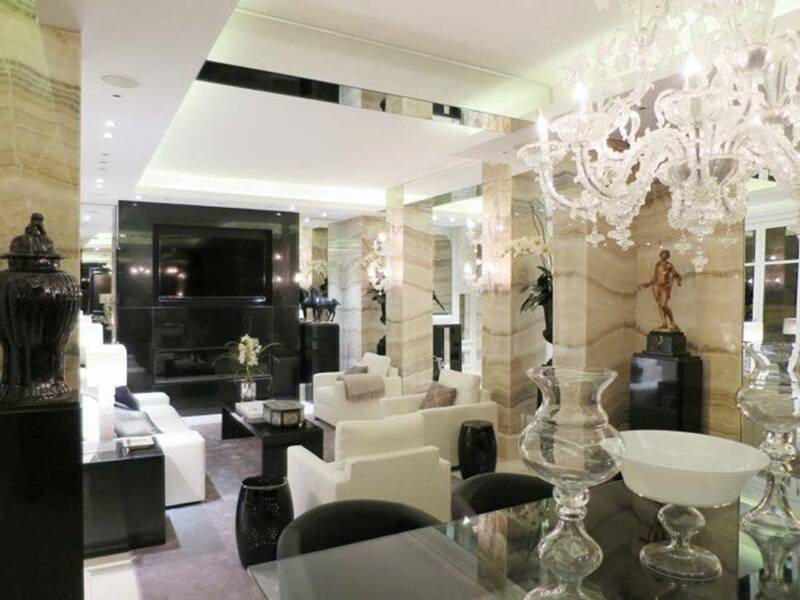 The interior is a marble marvel, a palace of glistening rock complemented by Murano crystal pieces, mirror-lined walls and contemporary furniture. In the living room, a monumental fireplace sits below a large flat screen television. The master bedroom boasts a king size bed, while the smartly appointed kitchen shimmers with jet black fittings. After watching the world’s tennis elite kick up clay dust at Roland-Garros, this apartment will offer a welcome change with it’s futuristic, elegant aesthetic.